I am an avowed recycler. Have been for over a decade. In fact, when I lived in an apartment in Washington, D.C. that didn't have a recycling program, I even hoarded my recyclables for 10 months (!!!) until a friend with a pick-up truck helped me get them to a recycling facility. Glenn and I recycle everything that we can now, from junk mail, to toilet paper rolls, to the more obvious glass, plastic, and aluminum. There are, however, on occasion, items I encounter which I become suspicious about whether their entire contents are recyclable. For instance, plastic spray bottles for household cleaning products. While the bottle itself, if imprinted with a #1 or #2 in the chasing arrows on the bottom, may be recyclable, what about the spray nozzle? Do I toss it in the trash, destined for the landfill, or leave it atop the bottle it came with, and toss it in the recycling bin full of wishful thinking? Neither option has ever appealed to me, so I came up with what I think is the best alternative: make my own replacement cleaning solution to go right back in that now-empty bottle. Dilemma solved! Plus, in the long run, you save a heap by whipping up your own brew. The materials used in the solution are common, inexpensive household items, aside from a few essential oils. The oils, though, will last for some time as only a few drops are required with each batch. Once your ingredients are assembled, it takes only about 5 minutes or less from start to finish to prepare your homemade cleaning solution. It smells great, it's naturally anti-bacterial, it's inexpensive to make, and it eradicates the spray nozzle quandary. *Place all ingredients in spray bottle using a funnel or measuring cup with a spout. Shake vigorously and use with abandon! Not to slight my 5 cats, but I think I'm becoming a dog person. It was pretty chilly here yesterday evening and my pooches and I snuggled on the couch. It was a 2 dog evening. They warmed me right up, plus, they have velvety ears I like to rub. A cat on the lap is pretty darn nice, but thermal mass isn't really their realm of excellence, you know? So, Buncombe County, where I live, is running out of gas, thanks to Ike. And bureaucracy. I haven't gone out much in the past few days, which is great when one is working on writing a series of books! In recognition of the gas crunch, and my own dependence on fossil fuels, I've decided to, in the true spirit of "small measures", take back the air! Literally. What that means is that I'm returning to line-drying my laundry. With 5 indoor cats and 2 dogs, it doesn't do much in the way of remove animal fur from freshly laundered items, but it sure does cut down on the electric use. Plus, it smells all mineral-y and sunshine encapsulated. Or something akin. Go ahead. Don't take my word for it. Air your formerly dirty laundry yourself! Here's a quick tip I've been intending to mention but just never seem to remember. I'm burning essential oil of peppermint, rosemary and roman chamomile at the moment, however, which allegedly help both memory and motivation, so, I figure this is the chance to write it down. So, I do this little trick with coffee when I make it at home that renders it truly exquisite. It's easy, it's cheap, it's delicious, and it takes you places. What's the trick? When grinding up your beans, crack open a cardamom pod and drop the seeds in along with the coffee. Be sure to toss the pod into the compost; it's just the seeds you're after. Grind it up until you've rendered the beans to a fine powder. Add to your press or coffee pot, add water, and voila! Your own Turkish coffee facsimile, in the quiet pleasure of your own jammies. I haven't tried it out yet, but I think a bit of cinnamon bark or a whole clove would create an equally aromatic cuppa joe. Bottoms up! For those of you who may not know, my husband Glenn plays Scrabble competitively. It's rather cutthroat, albeit it civil, from what I gather. Each Sunday, we kiss and part ways, he to spend the next 4 hours huddled over a Scrabble board at a big box book retailer, me to make a cake, scratch the dog, take out the compost. This past Sunday, he returned bearing gifts. Unsolicited gifts. Not-my-birthday-or-Christmas gifts. He's like that. The generous gifter. In any event, amongst the book store gifts he festooned me with was a copy of "Gorgeously Green" by Sophie Uliano. I'm no stranger to the craft of greening home and body and community, but this book, well, it's got it going on. Covering everything from beauty to health to transport, food, travel, even appliances, "Gorgeously Green" is THE definitive tome for ladies who want to have, as she puts it, "one Jimmy Choo on the pavement, the other in the soil." Not that I wear Jimmy Choos, or ever aspire to (last shoe purchase was work boots! ); not that I get manicures, or ever aspire to (my nails can generally be found with dirt underneath of them, thank you very much); not that I need glamour on a regular basis (although I did work on my chicken book wearing high heels at home last week because, well, I blame Sheila E.). Despite all the "not that's," this book provides an abundance of valuable information. 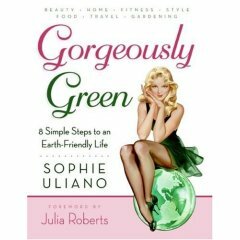 If you're already a dyed in the wool "Gorgeously Green" lady, then get this book for your friends. It's powerful. If you still need convincing, consider that the author got Oprah and Julia Roberts to espouse vermiculture, complete with visibly slithering worms, on Oprah's show. 'Nuf said. I'm obsessed with the New York Times rapidly changing headlines today. Lehman Brothers and Merrill Lynch are in trouble, facing sell offs and liquidation. Honestly, I'm not really sure what that means, but I find it ominous. This is giving me pause way more than the Hadron Collider rev up did. I find myself reading the Times articles, silently clucking my tongue in concern, having no idea what they are actually saying. and to stop fluttering back to the NY Times obsessively, I want to share a highly successful recipe with you. Needing to make use of some local fig and blueberries last week before they went bad, and having eaten as many of them fresh as I could stuff myself with, I decided it was time for an oat bar. My inspiration came from one of my favorite food blogs, Smitten Kitchen, who created an oat bar with raspberries that, had I a pint on hand, would have been my filling of choice. Sorry figs and blueberries, but it's true. A ground up oat and butter base was topped with a fig, blueberry, and orange center, and then sprinkled with a nutty oat and spice topping. The result was heavenly. Glenn said they were "really good, sweetie." That sealed the deal. When something turns out just so-so, he declares either "that was good, sweetie" or, worse, "that was fine, sweetie." Though always finished with "sweetie", I'm quick to note the subtext. "Really good, sweetie" means I hit it out of the park. And so can you. This was truly easy to make and bakes up a good sized batch, for sharing or hording, your choice. -Preheat your oven to 350. Butter or oil a 9'x13' metal or glass pan. I actually oiled my pan with coconut butter, but you can use whatever you'd like. Tear off a piece of parchment paper long enough to hand slightly over the top of your pan. Butter or oil the parchment paper on top and sides. -In a food processor, place all crust ingredients except for the butter. Pulse in bursts until combined. Add the butter and pulse until crumbly. Set aside 1 1/2 cups of this mixture. If you'd like, add toasted pecans or walnuts to the reserved topping. -Put the rest into the pan, and press down with your hands until level. Bake for 15 minutes. Remove from oven and cool for 15 minutes. -While crust is cooling, in a mixing bowl, combine brown sugar, orange zest, flour, cinnamon and nutmeg. Add figs, blueberries, orange juice and butter; toss to coat. -Spread filling on top of cooled crust and sprinkle with reserved topping. -Bake for 45 minutes, until top is golden brown. -Cool. Remove bars from pan by lifting parchment. Set bars with parchment on top of a cutting board. Cut into 20 small or 12 large bars. Mountain pig race is 4 pigs long, do-da, do-da. 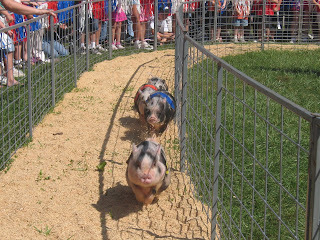 Vietnamese pot-bellied pigs, running the track. There isn't much cuter, except for possibly the duck race that preceded the pig race. Lemonade was drunk, screaming on rides occurred, and brahman bulls were ogled. All in all, $5 well spent. *Thanks to the mighty Nicole for the amazing photos. Today marks a milestone. 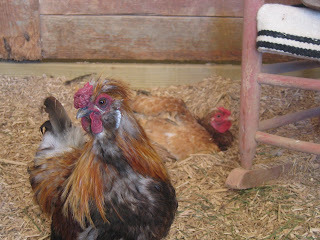 I submitted my first bit of text for the Raising Chickens book. That's like, a tenth of the book. Considering this is my first foray into the world of professional publishing, replete as it is with deadlines and public scrutiny and a general air of professionalism to which I am still getting acquainted with, I feel pretty good about the whole thing. It doesn't hurt that one of my closest friends is my editor. This is the same friend that both initially approached me about authoring the series AND vouched for my husband when he first sent me a Myspace message. This, you'll gather, is quite a good friend. As a matter of fact, yes, that is a giant bread snail. After I e-mailed off the first chapter, I felt it best to go shopping. I ordered these, for schlepping and hauling assorted and sundry things around the property, then headed out to buy a gift for my recently turned 83 year-old grandmother, for whom Glenn and I are hosting a little family brunch tomorrow. He'll be making his famous crab cakes and I'll be firing up the oven for my famous carrot cake. We're heading on Sunday to the Mountain State Fair . I'm putting my money on the pig races. Who wouldn't? So, apologies for the paultry amount of posts in August, but, as much as I hate saying it, I was too busy. Writing a book, hosting friends from Philadelphia for a week, going to Florida for my younger brother's wedding, heading to San Francisco a week later for the Slow Food Conference; you get the gist of it. I'm around for now, though. Typing, baking cakes, and betting on pigs. I write this having just returned from an incredibly inspiring weekend at the Slow Food Nation conference in San Francisco. Marion Nestle, Winona LaDuke, Alice Waters, Eric Schlosser and Michael Pollan were amongst the speakers I was able to hear. Re-iterating the mantra of Slow Food's founder, Carlo Petrini, that food must be good (that is, delicious), clean (sustainably produced) and fair (for all involved, from grower, to harvester, to server, to those ingesting it),the conference approached food production from all angles, comprehensively addressing the subject. Marion Nestle, emphasizing the need to keep the pressure on government officials to craft new food policy, was particularly engaging. She referred to the U.S.'s system of food surplus production (necessary for showing required corporate profit), when coupled with suspect safety standards, as resulting in a broken food system. As the Paulette Goddard Professor of Nutrition, Food Studies and Public Health at NYU, she knows a thing or two about food policy in this country. 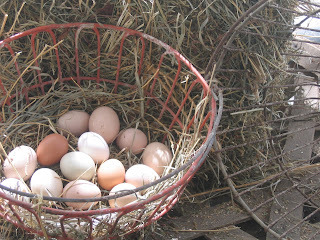 As part of Slow Food Nation's efforts to re-localize food distribution networks in this country, repeated stress was placed on breaking the distance between farmers and consumers and putting "culture" back in agriculture. Furthermore, in his discussion on Re-Localizing Food, author, journalist and professor Michael Pollan drew attention to the fact that the current presidential candidates cannot adequately address climate change, energy independence and health care, the three issues voters indicate as mattering the most to them, without addressing food policy and production. While emphasis on local production and use of foods was the focus, attention was also directed to what Petrini refers to as "virtuous globalization", that is, support of foods globally traded fairly and equitably. Perhaps my favorite part of the conference was the Victory Garden, planted on what was previously a stretch of turf directly in front of City Hall. Planted in concentric circles, a Native American agriculture technique, the garden was lush and abundant, while conserving water and resources. Imagine such a garden on the White House lawn! What an incredible precedent that would set for growing locally nationwide! As it was a conference about food, getting down to tasting it was an incredible delight. Held in the cavernous Fort Mason, the Tasting Pavilions were a series of vignettes showcasing artisan food categories nationwide. On display were producers of charcuterie, beer, bread, pickles, seafood, honey & preserves, tea, coffee, chocolate, ice cream, cheese, olives and wine. The intersection of art and food was epitomized at these stations. Careful curating culminated in an event that was as mesmerizing to behold as it was to consume! Ball canning lids, painstakingly attached to fishing line, were suspended above the pickle booth in a wave fashion. Above the indigenous seafood display, pointed fishing weights drew the eye up. Wooden pallets enclosed the chocolate area, alluding to the crop's import status, while baskets for gathering fruit surrounded the preserves area. When tasting beer, participants were offered hand-blown glasses; at a tea tasting, small ceramic cups from Sausalito-based Heath Ceramics held samples. Careful, scrupulous attention was paid to every aspect of the entire weekend's events. Striving to be a zero-waste and bottled water-free event, filtered tap water was instead offered, in either compostable cups or purchasable stainless-steel bottles, and waste disposal boxes were marked as recyclable, compostable, or landfill. Witnessing first-hand the interest and enthusiasm, let alone the feasibility of bringing about profound paradigm shifts in the way those in this nation interact with food, has left me humbled, enthused and motivated. And, in full disclosure, I've been listening to "A Love Bizarre" from Sheila E. and Prince while typing this, which has rendered me even more enthused and motivated than I might have been had I not been listening.